Photo shows (Left to Right) Jamie Ashwell (ICT Group Travel), Ian Marsh (ICT Group Travel), Victoria Berg (Cruise and Maritime Voyages), Matt Hogg (Cutting Out The Middle Man), Tony Cole (Cutting Out The Middle Man), Carol Ogden (David Ogden Coaches), Paul Cranley (Andrews of Tideswell), Claire Muir (Andrews of Tideswell) and Chloe Jones (ICT Group Travel). 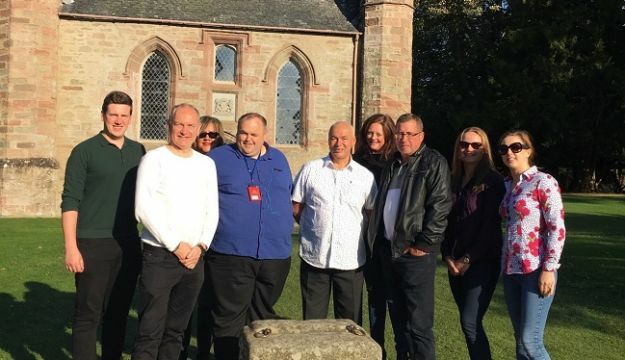 ICT in association with Visit Scotland and the Regional Tourist Associations of Tayside and Perth hosted a party of Coach Tour Operators to experience the newly named Unesco City of Dundee and the surrounding areas in the region. The city of Dundee itself is spread out on the picturesque strip of the Firth of Tay just a stone’s throw from the seaside escape of Broughty Ferry with its castle. To experience the region the group were accommodated courtesy of Redwood Leisure at the Best Western Invercarse near to the City Centre and then Best Western Woodlands hotel in Broughty Ferry. On the trip the group also enjoyed tours of St Andrews, the home of golf and famous meeting place for William and Kate, Scone Palace which has been the seat of parliaments and the crowning place of the King of Scots including Macbeth and Robert the Bruce, the famous Black Watch Museum in Perth where the group discovered the unique story behind Scotland’s premier Highland regiment and not forgetting a trip to Glamis Castle the legendary setting for Shakespeare’s Macbeth completed the itinerary. Whilst in Scotland … it would almost be an insult not to visit a whisky or gin distillery, and so a wee dram was enjoyed at the Kingsbarns Distillery and Gin Bothy. For more information or to obtain assistance in planning your future tours to Dundee and the Tayside region please visit www.ictgrouptravel.com or alternatively you can call ICT on 01708 802350 or email info@ictgrouptravel.com.